It's time to see the actual Summer TOP* 30. In the meantime I found out, that the exact followers number in the "1k+ club" could be find in the Facer app (in contrast to the web presentation). So please enjoy this precious data in the graphic below . Star or arrow at the designer name shows the change in last 6 month. 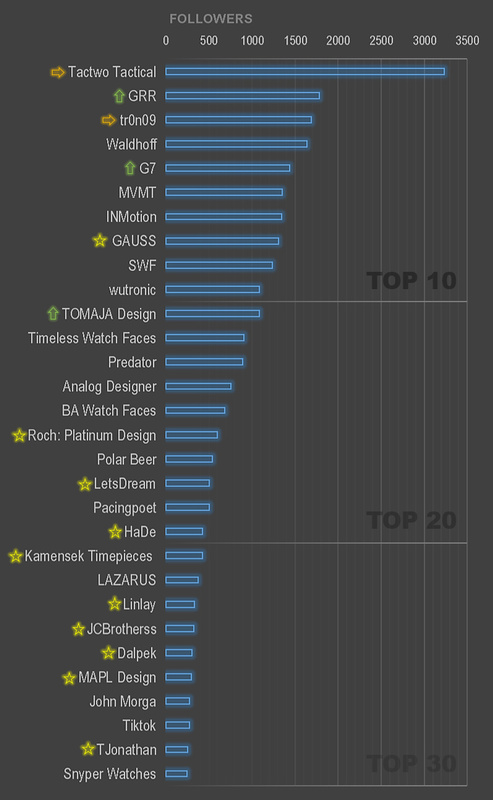 *Disclaimer: This unofficial TOMAJA Statistic Data based on the total followers number of featured and premium designers at the Facer platform. Please enjoy this date carefully (especially the positions under Top 15). If you know somebody, who actually should be in the ranking, please just write a comment or a private massage me and I will add this designer for the next TOMAJA Statistic Data post. Thank you . Thank you @Tomas! You are a gentleman and a scholar, helpful and interesting as always! Thank you for doing this, Tomas. You are an asset to this community. I know all of us appreciate your contributions. thanks for your feedback. I started collecting those data just for myself... But, why not to share those?